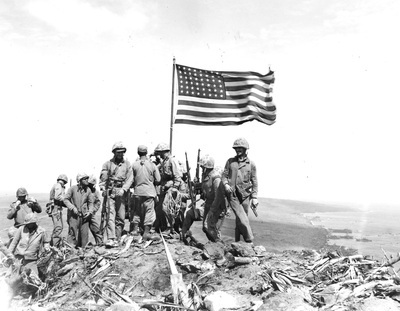 What I am posting on this page may be considered controversial and will be considered by some to be disrespectful to the memory of the brave Marines who fought and died for every inch of Iwo Jima. 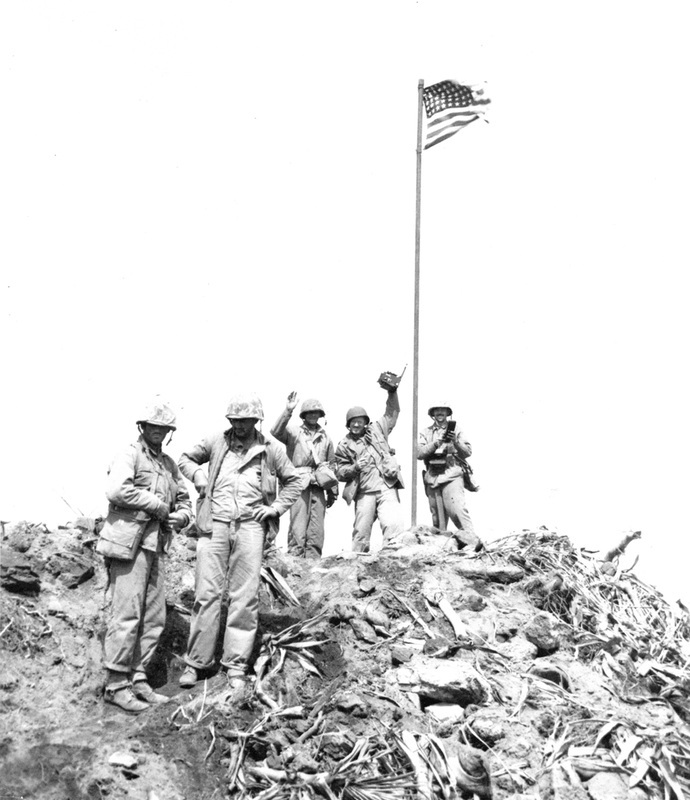 All that being taken into account, I feel compelled as someone interested in the events of this battle to accurately identify the Marines who were a part of the second flag raising on Mt. 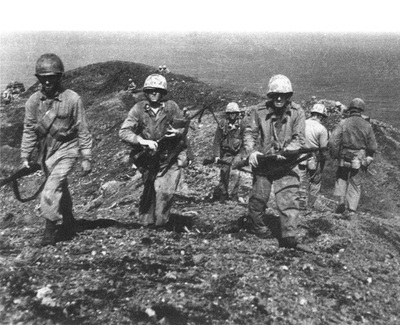 Suribachi. To start with, the case for having Pharmacist's Mate Second Class John Bradley included as one of the first flag raisers is a very strong one. The evidence is very obvious when looking at photos from that event. Examine the two photos below. The photo on the left shows the first flag about to go up. John Bradley is the man standing in the middle with the two large corpsman bags on both sides of his waist. 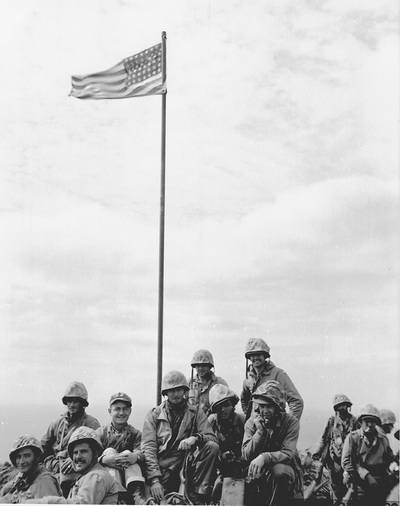 The photo on the right shows Bradley as the third man from the left, firmly grasping the flag pole with his left hand. His face is clearly visible and very recognizable. Please click on each photo to see the full-sized version. The next two photos show John Bradley with a group of Marines and corpsmen sitting in front of the first flag. Bradley is the farthest man on the left in the back row. This is more proof that he was at the scene of the first flag raising as the second flag had not been raised at this point. The photo on the right is a magnified version of the photo at the left. And finally, one more photo which proves that John Bradley was at first flag raising. 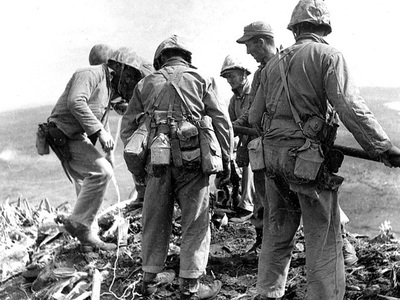 Bradley is the man standing at the far left with the large corpsman pouch on his right hip. The photo on the right is a magnified version of the photo at the left. 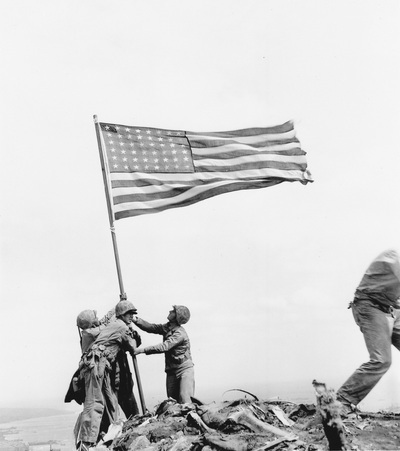 And now for the famous photo of the second flag raising taken by Joe Rosenthal of the Associated Press. The photo on the right is a magnified version of the photo at the left. 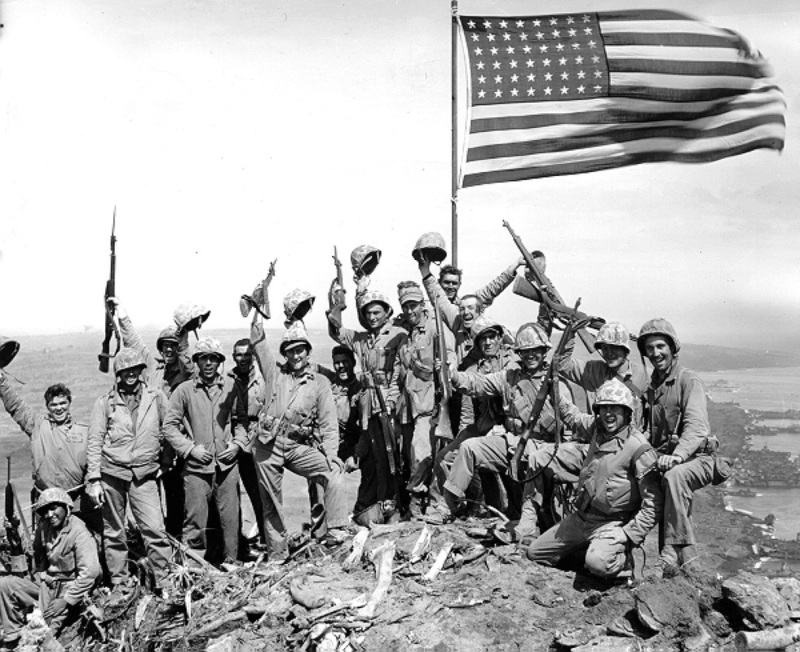 The six men in this photo have been identified as Private First Class Ira Hayes, Private First Class Franklin Sousley, Sergeant Michael Strank, Private First Class Rene Gagnon, Pharmacist's Mate Second Class John Bradley and Corporal Harlon Block. Ira Hayes is in the back with the field jacket draped over his belt, Sousley is in front of him with the rifle over his right shoulder, Strank is to the left of Sousley and barely visible, Bradley is in front of Sousley with his face visible, Gagnon is to the left of Bradley, and Block is in the front planting the base of the flag pole in the ground. These have been the identities of the flag raisers for 69 years. And it is incorrect. The man who has been identified as John Bradley is in reality Franklin Sousley. 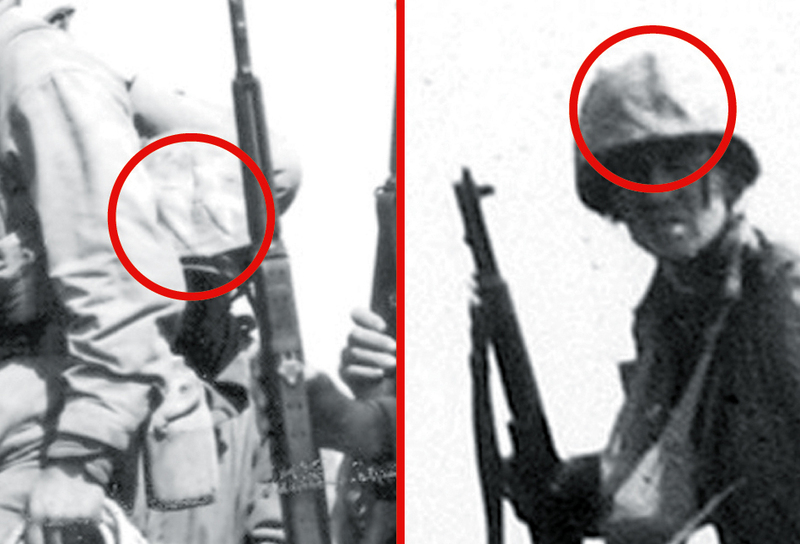 The identity of the man behind Franklin Sousely is in fact Private First Class Harold H. Schultz. There are five pieces of photographic evidence which combined together prove that the man standing in Bradley's position is not him and is actually Franklin Sousley. This flag raiser is wearing a cloth cap under his helmet. Bradley did not. This flag raiser is wearing an Army M1941 field jacket. Bradley did not at the time. This flag raiser is wearing a cartridge belt with no suspenders. Bradley was wearing a pistol belt with suspenders. The flag raiser has a pair of wirecutters in a pouch. Bradley did not have wirecutters on his belt. The flag raiser wore his pants uncuffed. Bradley's pants were noticeably cuffed showing his leggings underneath. The photo below shows Ira Hayes at the left, Franklin Sousley in the middle, and Harlon Block on the right. 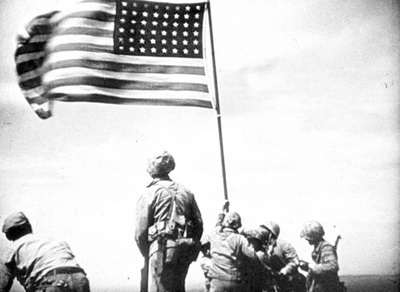 The man behind them in the shadows might be Michael Strank or it could be another Marine who jumped in to help. So in this photo, Franklin Sousley is wearing a cloth cap under his helmet, he wears a field jacket, he wears a cartidge belt with wirecutters clearly visible and the empty canteen carrier, and he wears his pants uncuffed. In this photo you can also see the ammunition bandoleer that Harlon Block is wearing around his torso. 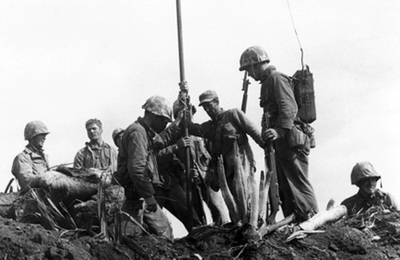 In the famous flag raising photo, you can see the strap from this bandoleer on the back of the man at the front. Proof that is was Harlon Block. The photo on the right is a magnified version of the photo at the left. 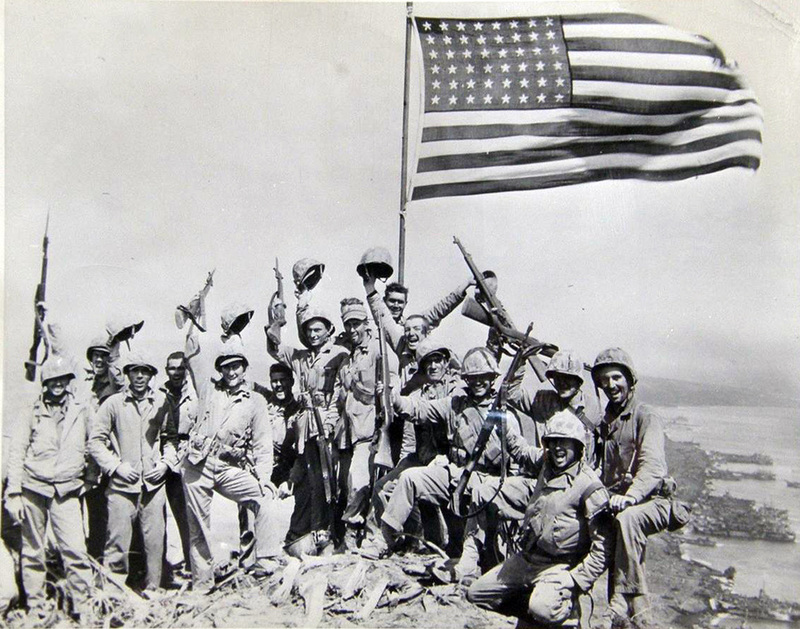 The photo at the left below is the famous "Gung Ho" photo of the Marines after the second flag raising. 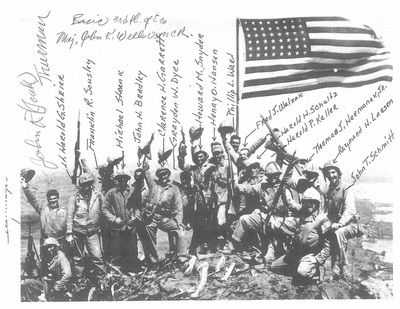 Franklin Sousley is the figure partially in shadows in the back row at the left holding his rifle up high. In front of him with his thumbs in his pockets is Mike Strank. 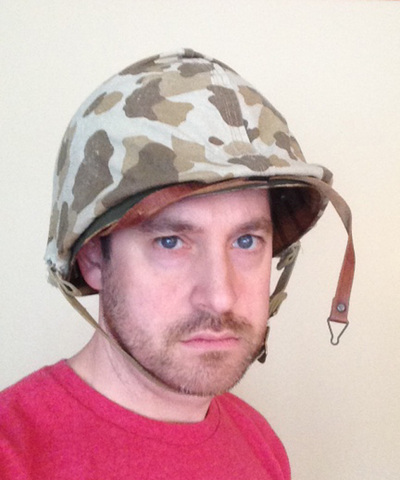 To Sousley's left left in the shadows, holding his helmet up, and not wearing a cloth cap, is John Bradley. The middle photo below shows the moment either just before or just after the "Gung Ho" photo. 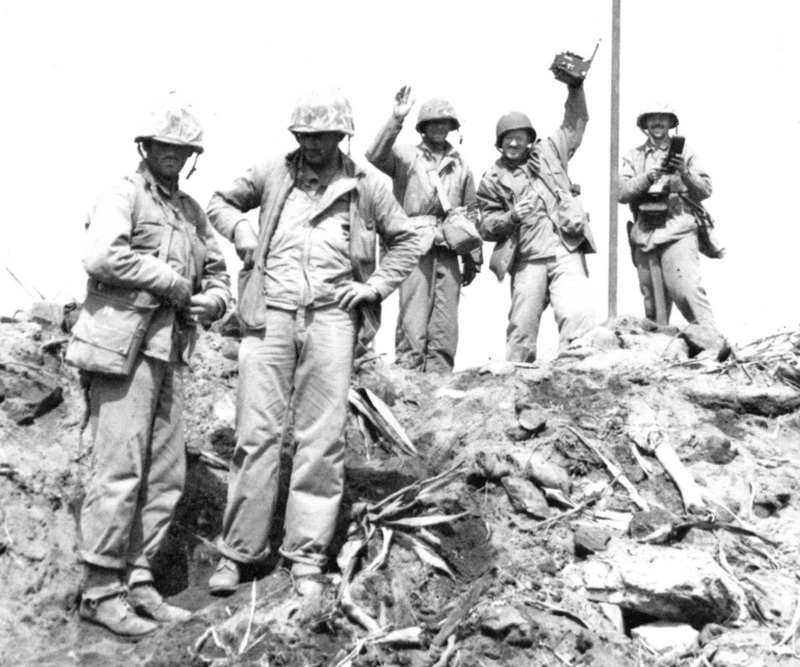 Sousley is standing in the same position with his field jacket, cartridge belt and uncuffed pants clearly visible. The empty canteen carrier on his right hip and the wirecutters pouch match up exactly with the figure in the famous flag raising photo. The photo on the right is a magnified version of the photo in the middle. Below is one more photo showing the faces of Franklin Sousley, far left, with Mike Strank to his left, and John Bradley just behind Strank holding his helmet. 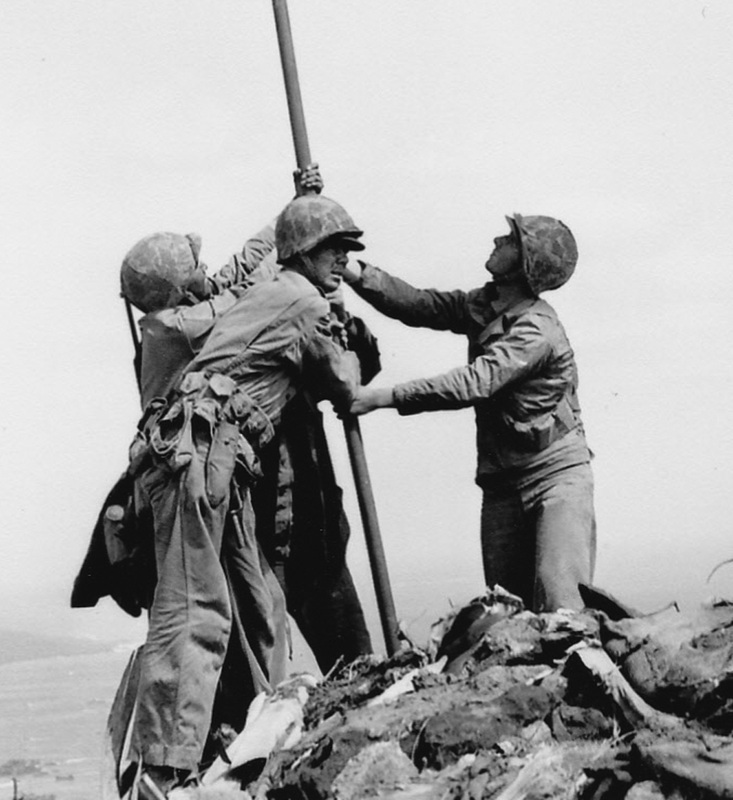 Franklin Sousley's face as seen in this photo with the cloth cap under his helmet very much resembles the profile of the famous flag raiser in the position identified as John Bradley. The photo on the right is a magnified version of the photo at the left. And now for the mystery flag raiser standing behind Franklin Sousley. 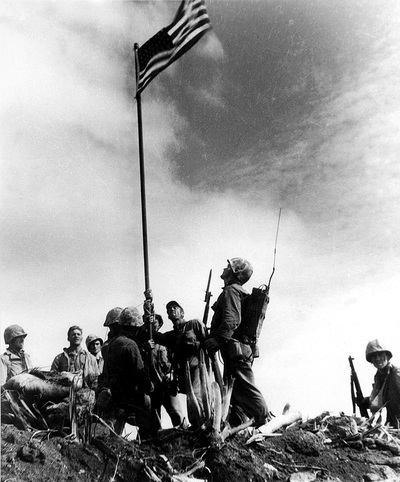 Below is a photo of the second flag raising as it happened. This is a still image from the film shot by Bill Genaust. Ira Hayes is at the back identified by the field jacket over the back of his belt. The man to his left, hidden by Hayes, has always been identified as Mike Strank. The man at the front bending over the pole is Harlon Block. The man behind him we can now identify as Franklin Sousley and not John Bradley. The man on the other side of Sousely is Rene Gragnon, his face somewhat visible in this shot with his rifle slung over his right shoulder. And that leaves the man behind Sousley - the mystery man. The mystery man is wearing an Army M1941 Field Jacket. His jacket appears to be open and he is wearing an ammo bandoleer. He has a canteen and knife attached to his belt, but his belt is not visible. 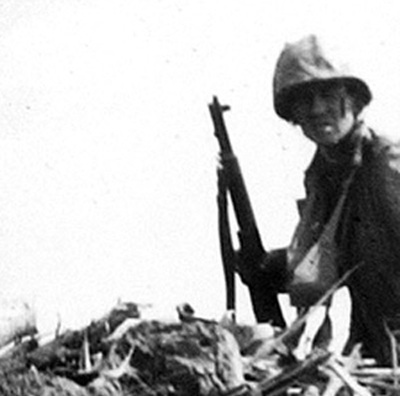 He has a M-1 rifle slung over his right shoulder without a bayonet attached. And there is something hanging from the front of his helmet. After extensive photographic and film research, this man can now be correctly identified as Private First Class Harold Henry Schultz. 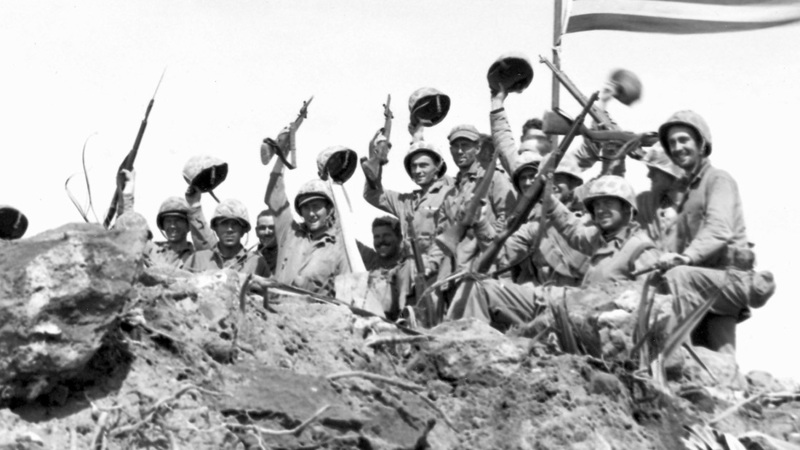 To start with, Harold H. Schultz has been identified as one of the Marines in the famous "Gung Ho" photo. The photo on the left side below has his name written with an arrow pointing to his position in this photo. 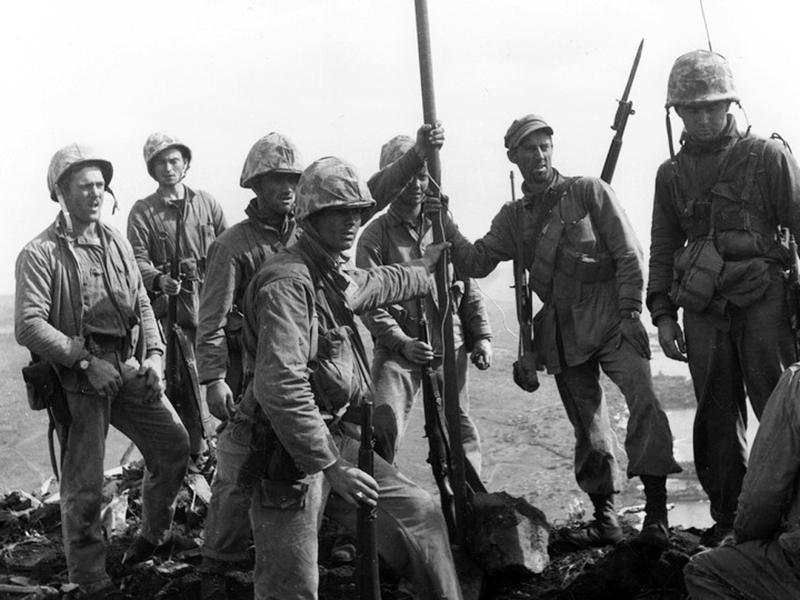 He is the fifth man from the right with a M-1 rifle raised in his left hand. The photo at the right is the highest quality image I could find of the "Gung Ho" photo showing his face. There is a strange shadow over his left cheek. In examining all of the photos where Schultz has been identified, one of his distinguishing features is his rather prominent nose. Here are two more photos which I believe feature Harold H. Schultz. 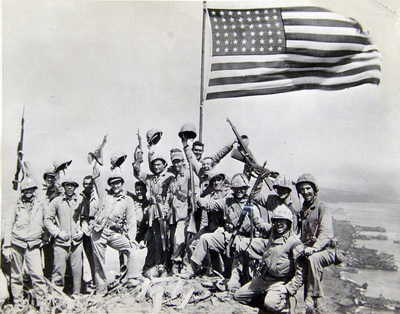 The photo at the left shows some of the Easy Company patrol climbing up Suribachi. 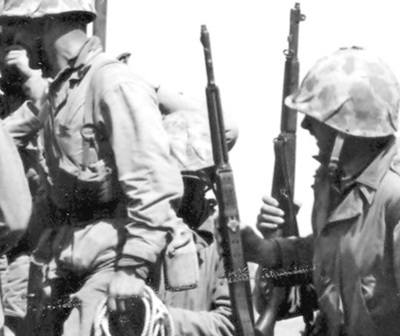 The three Marines in the foreground are, from left to right, Hank Hansen with no helmet cover, James "Chick" Robeson holding a BAR, and Harold H. Schultz with his M-1 rifle. The photo on the right shows some of the first flag raisers milling around the flag with Schultz off by himself at the lower right. 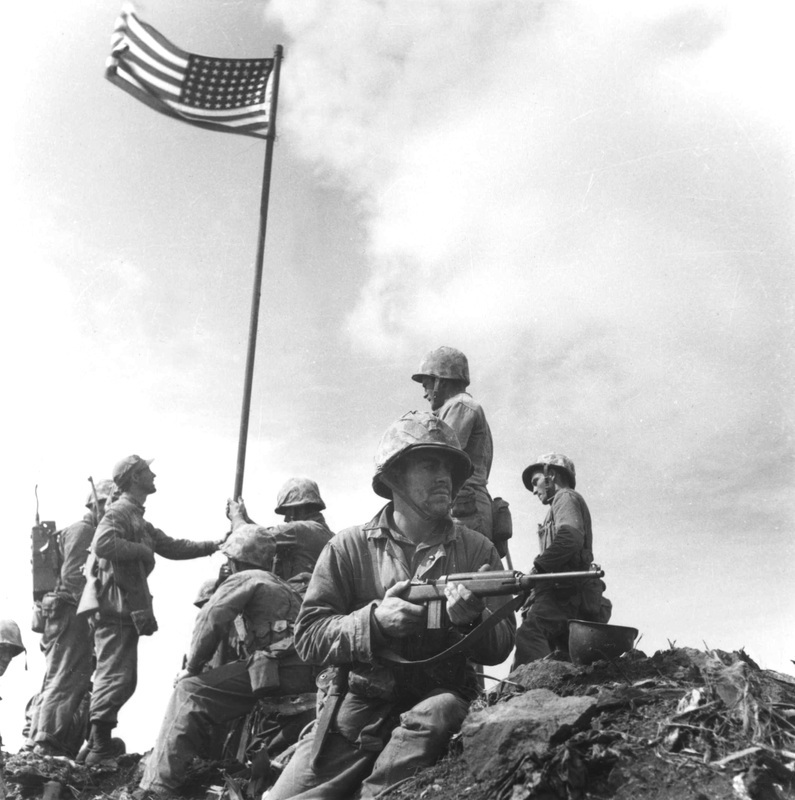 Note that he is holding his rifle in almost the exact same manner as in the photo at the left. And examining his uniform it is the same in both photos. He is wearing a slightly open field jacket, he has a bandoleer hanging around his neck, and his M-1 rifle does not have a bayonet attached. And now for the big "ah ha" moment. As it turns out, Harold Schultz can thank himself for being identified as a flag raiser. For it is one little detail in the way he wore his uniform that has marked him as the true mystery flag raiser. Examine the series of photos below from the first flag raising. 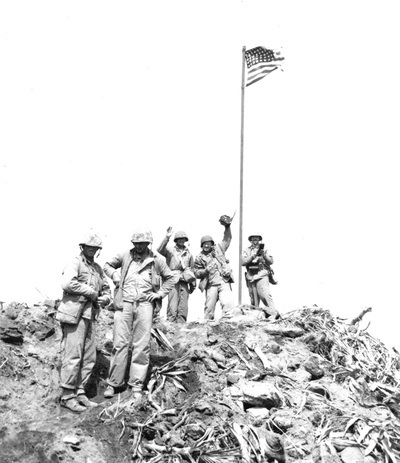 The photo at the top left is the famous first flag raising photo. The head just visible on the left side of the photo is Harold Schultz. You can see his rather prominent nose and that he has something hanging from the front of his helmet. The top middle photo gives a closer view of it. The top right photo shows Schultz's head along the bottom and the hanging thing is visible again. He is identified in the caption below. The three photos at the bottom all have Schultz by himself at the lower right. In all three photos you can clearly see something hanging from his helmet in front of his left eye. So what is that thing hanging from his helmet? It is my educated guess that it is the leather liner chinstrap to his helmet that must have come loose. Harold Schultz must have just pushed it back up between his helmet liner and steel pot instead of properly re-attaching it to the inside of his liner. The two photos below show what that would look like. I tried the same thing with one of my M1 helmets and liners. Depending on the angles involved, the lighting and shadows, and how Schultz had his actual strap hanging, this theory is completely plausible as to what the hanging object might have been. One other theory is that the hanging object is actually just a torn section of his cloth helmet cover. And here are some photo from the second flag raising. 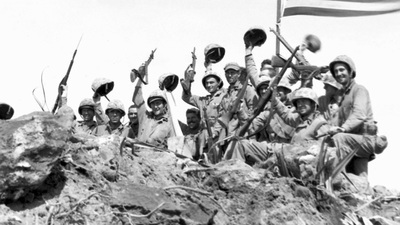 For the photo at the left, if you look closely at the man at the far right with the rifle on his shoulder, he has something hanging from the front of his helmet. He is wearing a field jacket and his rifle does not have a bayonet attached. The middle photo is the shot just before or after the flag raising. Schultz is standing in the same place as his is identified at in the "Gung Ho" photo above. He is mostly hidden, but if you look at the zoomed in photo on the right, you can see his helmet and what appears to be a liner chinstrap coming out from his helmet. 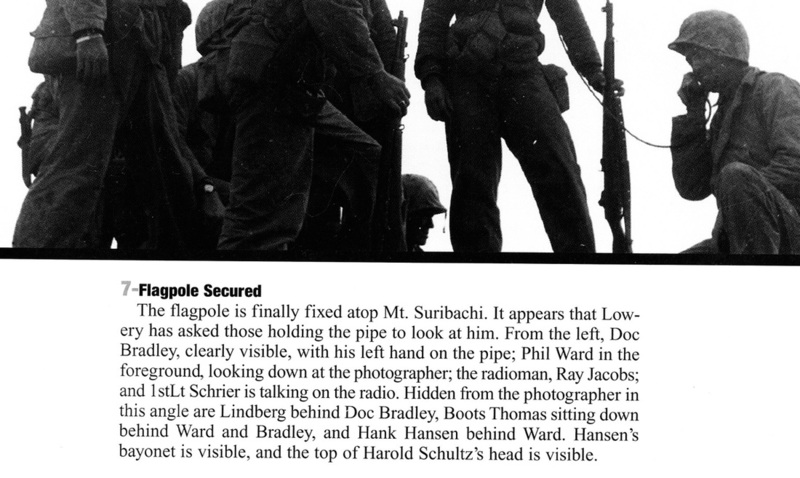 One more piece of photographic evidence which links all of the photos of Harold Schultz together is the folds of his cloth helmet cover. No two helmet covers are identical making each one almost like a fingerprint. Each one presents the camouflage pattern differently as each cover is cut from a different part of the patterned roll of HBT fabric. 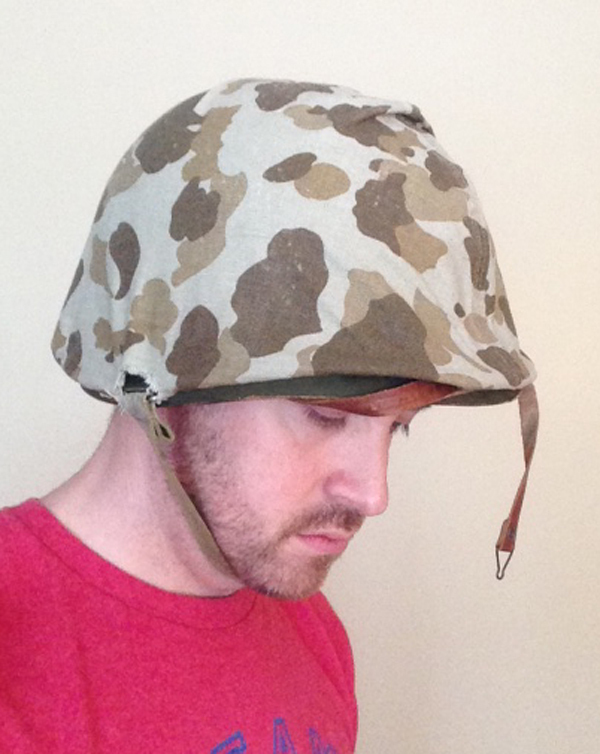 Once applied to a helmet, the way the cloth folds, creases and forms to the helmet is unique for each individual helmet. The photo at the left and middle below show the front of Harold Schultz's helmet from two of the photos presented above. When shown side by side, as I've shown on the right, you can see the same two diagonal crease lines running from top left to bottom right. They are the same distance apart in each photo and the same length. The shadows they cast make them very distinctive. But the undeniable evidence here lies in the video shot by Bill Genaust. Watch the video below. 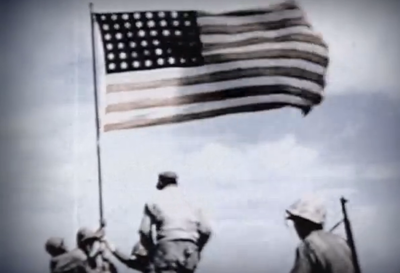 The flag raising scenes start at about 2:22. Closely follow the mystery man who hops into the group behind Franklin Sousley. And keep and eye on the front of his helmet. Something is blowing around, hanging on the front of it. 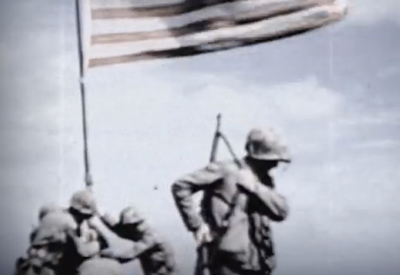 The video will skip right after the flag is up, but keep following the Marine with the rifle on his shoulder as he walks forward and picks up some rocks or something to stabilize the flag. 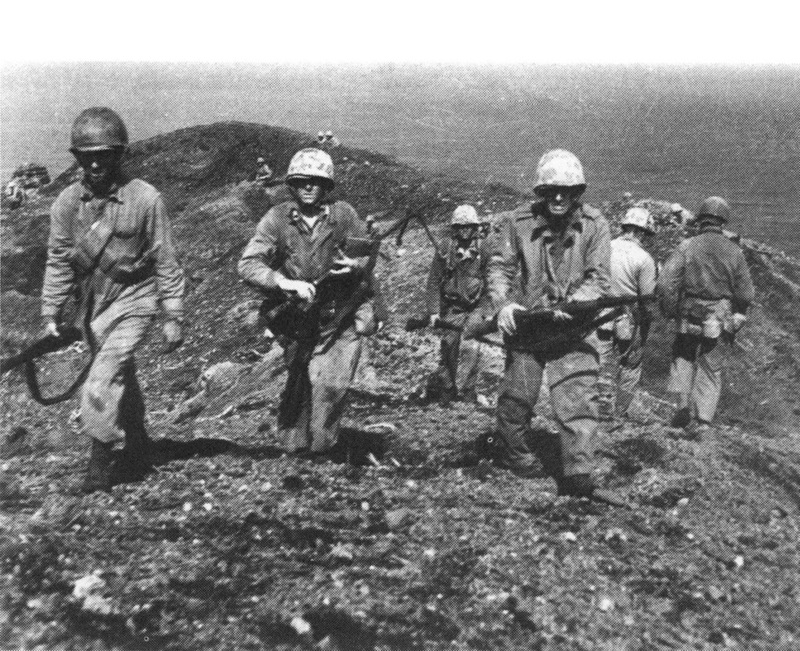 The liner chinstrap or piece of torn cloth on his helmet is clearly visible as it waves while he's moving. If Pfc. Harold H. Schultz is the Marine with the thing hanging from his helmet, then I am 100% positive that Harold Schultz was one of the six famous flag raisers. Here are two screen shots from the video. Schultz is the figure with the rifle on his shoulder. If you look closely you can see the strap hanging down from the front of his helmet. 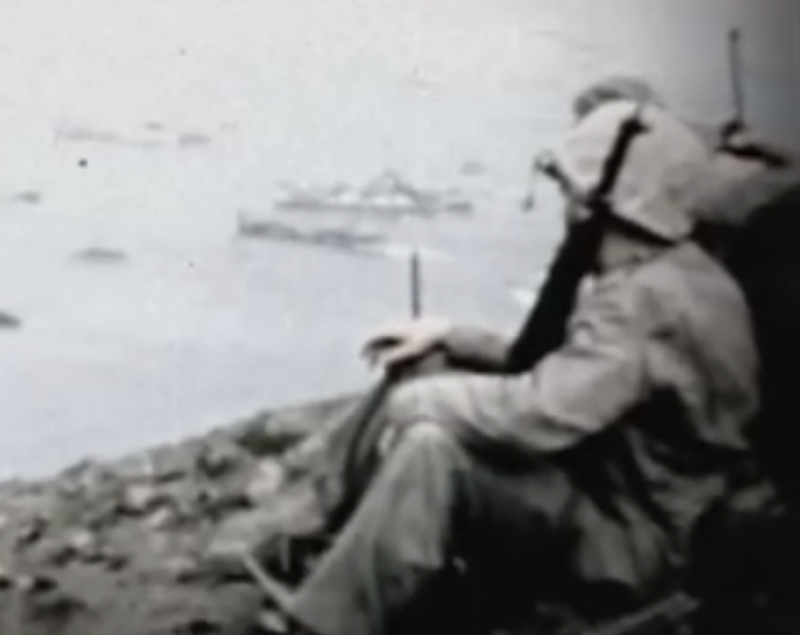 Here is one more still photo from the same video at the 3:17 mark that shows who I believe to be Harold Schultz looking out over the beaches. You can see his field jacket, his rifle, and the ever present hanging strap from his helmet. 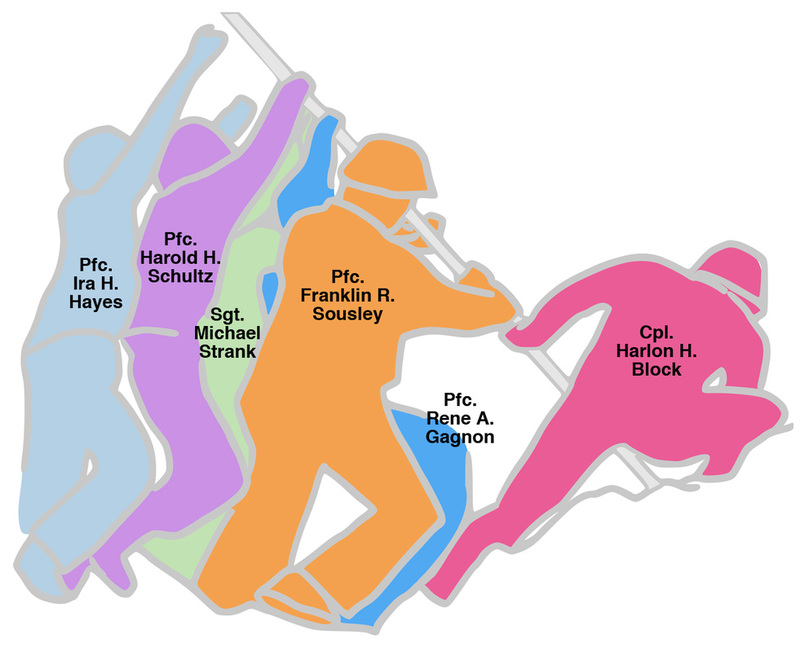 In closing, here is a diagram which correctly identifies the six flag raisers. 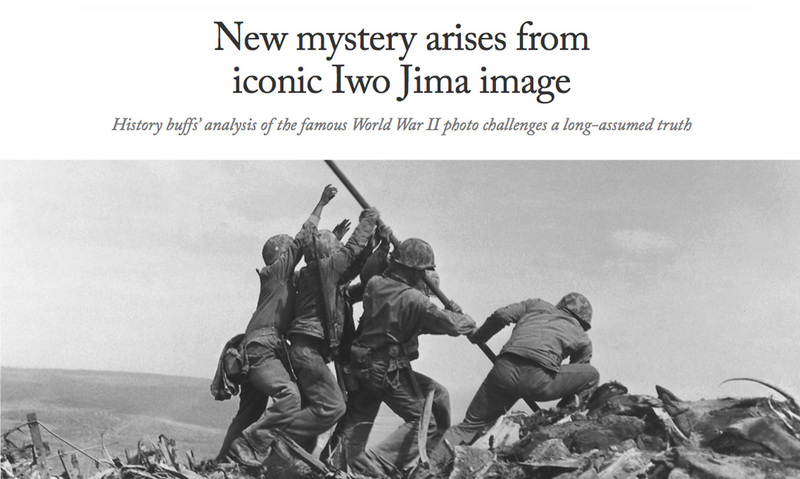 I have come to this conclusion with the help of other individuals interested in using photographic evidence to determine who raised the second flag on Iwo Jima. 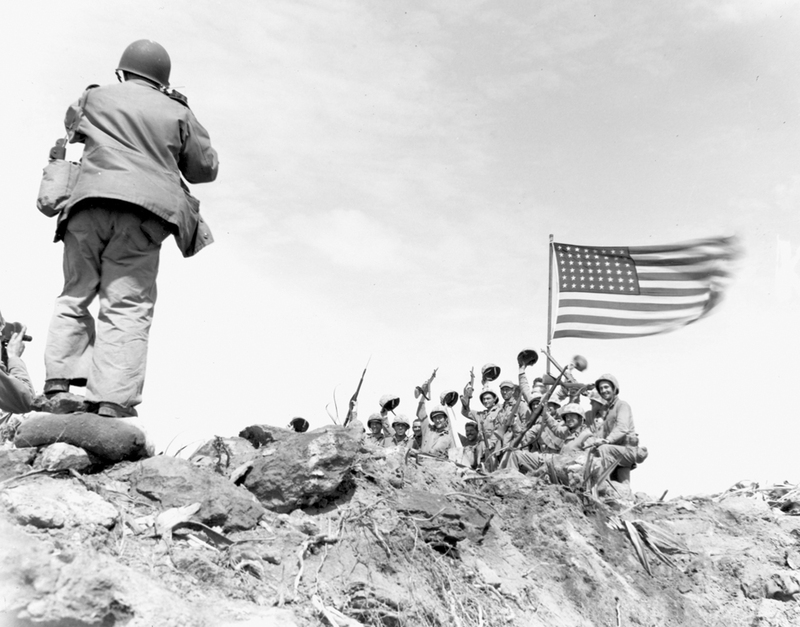 There were tremendous circumstances at work on Iwo Jima as "The Photo" came into existence and a mad dash was on to find the flag raisers in Rosenthal's photograph. 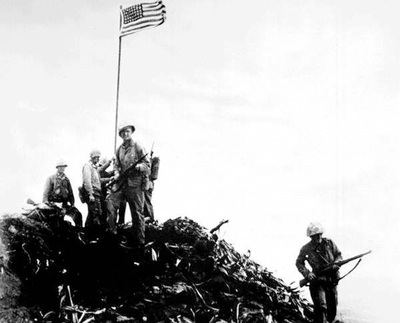 Mike Strank, Harlon Block and Franklin Sousley were killed on Iwo Jima following the flag raising, Sousley just days from the end of the battle. John Bradley, Ira Hayes and Rene Gagnon were brought home as they were identified as being on Suribachi and a part of the flag raising. John Bradley, in my estimation, raised the first flag and was then misidentified by Rene Gagnon or Ira Hayes as one of the second flag raisers. When watching the video of the events unfold, it appears that Harold Schultz saw what was about to happen, stepped right in and helped push the pole up, and then walked away to grab some rocks. Hayes and Sousley who were directly behind him and in front of him may not have even recognized that it was Schultz who was there helping them. It all happened so fast–the time between everyone holding the pole and the flag going up took only 10 seconds. 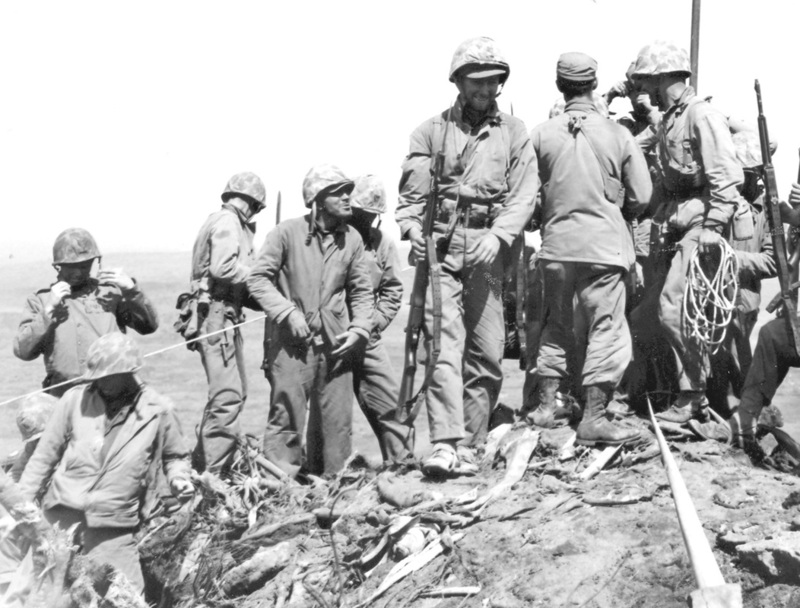 John Bradley was a very brave man and was later awarded the Navy Cross for administering aid to the wounded while under fire before sustaining serious injuries himself which necessitated his evacuation from Iwo Jima. 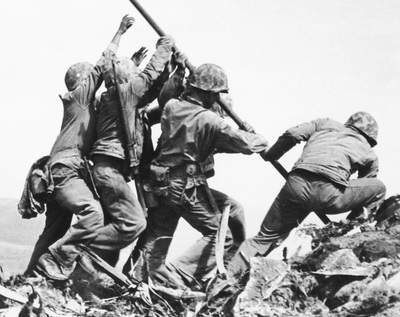 I am in no way trying to lessen the legacy and sacrifice that John Bradley made on Iwo Jima. I know his story very well. I know that he was a quiet man that just did his duty and then wanted to go home. 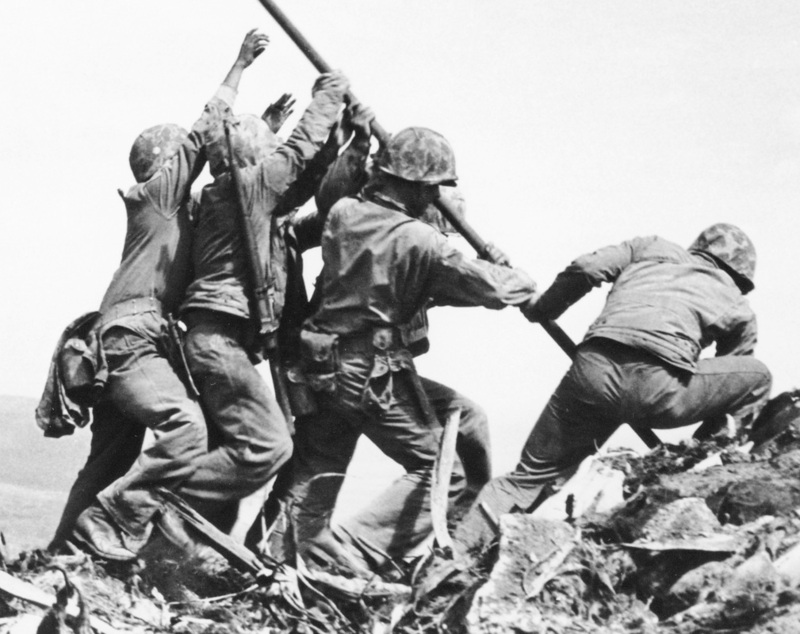 He never talked about Iwo Jima and his family didn't even know he earned a Navy Cross until after his death. 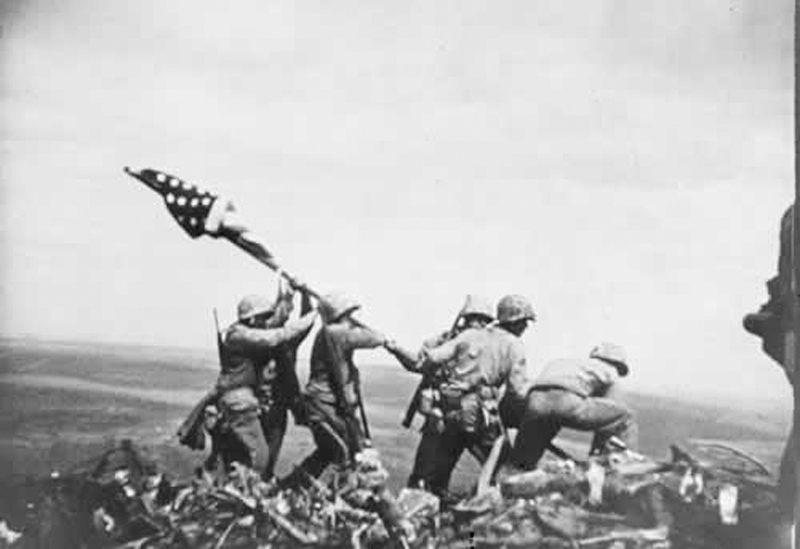 Photographic evidence is now available which proves he was most likely one of the first flag raisers. The intent of this project was merely to identify who was involved with the second flag raising. I am not making any commentary about anyone's actions, bravery, truthfulness, etc. The photos and video are all I worked with and all that I needed. Franklin Sousley rightly deserves to be recognized correctly for where he stood in the famous photo. 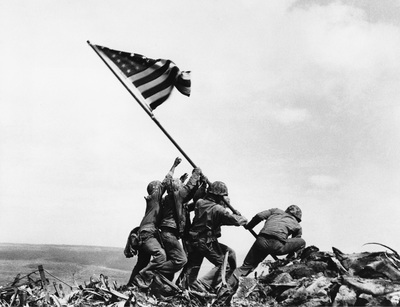 And Harold Schultz should be given credit as part of the most famous photo of World War II. 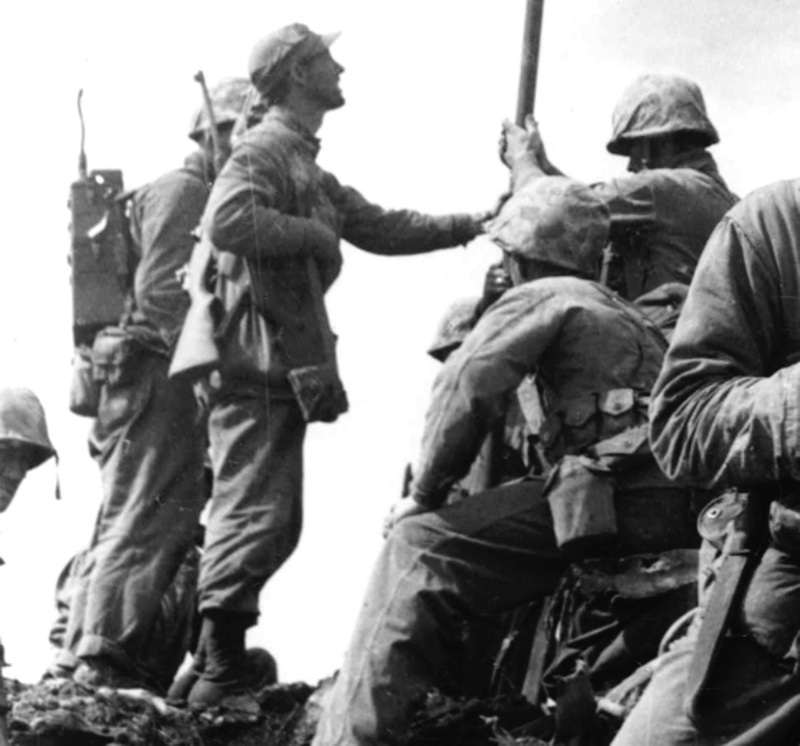 This same conclusion was presented to the United States Marine Corps by a friend of mine and was met with an unfavorable response. It is my belief that most folks just want to believe that the history in this case is simply that, history - and to just leave things the way they've always been. If anyone has any opinions on the presentation of these findings, please feel free to contact me. 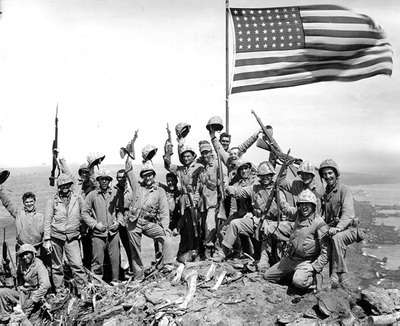 Please understand that I hold these men in the highest regard and will continue to do all that I can to see that their deeds are always remembered.